This deodorant caught my eye as it had the "Customer Favorite" designation at Cambridge Naturals, a local store that attracts its fair share of natural deodorant seekers. I like the smell so much that I will defend the hyperbolic language on the packaging: "Like the musical notes in a fine symphony, the herbal essential oils and natural vitamins harmonize in Aubrey's E Plus High C Roll-On." It is a harmonious smell! Whenever I catch a whiff of it, I find myself wondering what smells so good, as the fragrance remains slightly unfamiliar and changeable to me, even after near daily use for the last two months. It smells a little bit like an Aveda salon, mixed with the freshest section of the natural foods/crystal store, with floral and citrus notes that tread very lightly, and smell as cool as the roller ball feels. This was my favorite deodorant before discovering Soapwalla, and it's back near the top of the heap these days. Both the Pure Vanilla and the Vanilla Coconut (my preferred flavors) have this minty, paste-like note that I find so satisfying. The worst thing about this deodorant is its product to packaging ratio feels like its 40:1, and a bunch goes to waste because of the poor design--extra-irritating when you are paying $14 for a stick of the stuff. If you thought paying $14 for a stick of deodorant was nuts, steer clear of Dr. Hauschka's Deodorant Fresh Roll-On, which sometimes runs double that (though I've found it for $20). My friend Jenny was teasing me recently about my $40 deodorant habit, and in defending myself against what seemed like an absurd accusation, I failed to realize how close to the bone she was cutting! Looking at this lineup, it would appear my pits are prized skin real-estate. Dr. Hauschka's Fresh Deodorant, in its heavy, frosted glass bottle, does have a luxurious feel to match its price, and it smells very good and blue-green, with a faintly woody barber shop vibe that I think will be especially appreciated by those taking tentative first steps into the land of natural deodorants. I find this spray deodorant intermittently effective, and sometimes a bit too bracing (it's like Listerine for the armpits). Perhaps the key to success with natural deodorants is to keep switching them up. Even though it seems I've had my bottle of this forever, I like having it in the mix. I was disappointed, though, to dislike the rose in this deodorant line, especially since most of Weleda's rose body products are so pleasing to my nose. 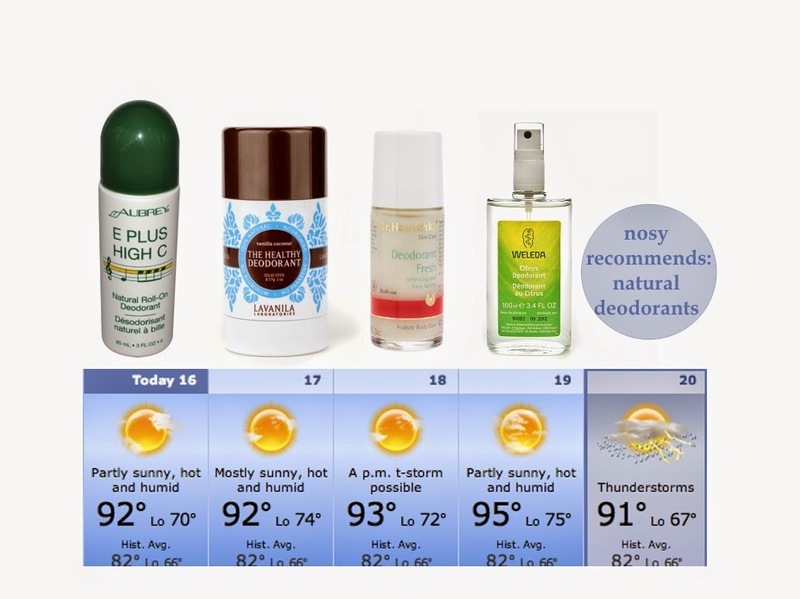 If you have other natural deodorant favorites, I am clearly all ears and eager armpits. Tell me about them! I've used Queen Helene Mint Julep deodorant stick for years. (really. 40) Recently, my health food store didn't have it on the shelf, but special ordered it for me with no problem, so it seems to still be in production. Less than $5 a stick. Thanks for the recommendation, woodgirl! I've never even seen this deodorant, but I'm definitely going to give it a try (40 years efficacy is a pretty fine endorsement). We -- especially Rob -- love the Weleda Citrus one. Bracing indeed, but it's a good wake-up-and-face-the world jolt for the pits.